In the early 1930s, when Linus Pauling first became involved in the study of biomolecules, very little was known about "the mysterious protoplasm." Today, we live in an era of molecular biology, with all its attendant benefits: Improved medical care, higher crop yields, new processes, new products, and new industries. Pauling played an important part in several fields. He made important advances in immunology. He discovered the first "molecular disease" in a protein molecule and linked it firmly to a genetic basis. He found a way to cut through conflicting data and present detailed atomic maps of likely protein structures years before anyone else thought it would be possible. Sections of his alpha helix and pleated sheet structures have been found in the majority of living proteins. He is justly considered one of the founding fathers of molecular biology. At the same time, Pauling's personal charisma, persuasive speaking abilities, powerful teaching skills, and publicity seeking have led some observers to overemphasize his contributions at the expense of others. The discovery of the alpha helix, in particular, has achieved the status of legend (helped by Pauling's own story-telling about his time in England). While an important advance, the alpha helix (and pleated sheet) should be recognized for what they are: secondary structures that explain little about the functioning of active proteins. As science historian Joseph Fruton wrote in 1999, "Although the alpha helix turned out to be a prominent feature of the structure of myoglobin, as more crystalline proteins were examined in later years, many of them exhibited much less helical content and some, like chymotrypsin, do not appear to have appreciable alpha-helix content. The pleated-sheet structure has been identified in parts of many proteins, but there are also stretches of the peptide chain in the form of irregular loops and turns." Sections of the alpha helix can be distorted. Sections of pleated sheet are often twisted. In other words, proteins are far more complicated and varied than anyone, including Pauling, thought. Still, he had a vital effect on the history of the field that went far beyond his own contributions. Pauling's emphasis on the primacy of molecular structure; his flexible approach to data interpretation; rejection of "magic number" theorizing; insistence on playing the game by the rules of chemistry; and well-publicized successes all proved critical in inspiring the sometimes more important research of those who followed. Perhaps the most striking example is the work of Watson and Crick, who consciously aped Pauling's methods in their successful attempt to find a structure for DNA. Pauling was, in short, a pioneer. Every molecular biologist today owes a debt to his insights, methods, and discoveries. See Also: "The Stochastic Method and the Structure of Proteins." July 29, 1953. See Also: Letter from Linus Pauling to Ralph W. Lewis. October 9, 1957. See Also: "Molecular Structure of Proteins." January 18, 1967. 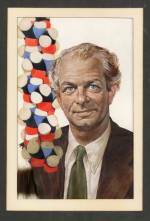 Oil portrait of Linus Pauling, featuring a model of the alpha-helix in the foreground. 1951. The R.V. Alpha Helix. 1966.